Group of Supra-molecular Structure | Division of Biological Science, Graduate School of Science, Nagoya University. Our research aims at understanding the physiological significance of the assembly and disassembly of biologically important macromolecular complexes. To pursue this goal, we combine X-ray crystallography, cryo-electron microscopy and NMR in order to determine the structures of crucial complexes, and then perform decisive functional assays based on these structures in order to establish molecular mechanisms. Our current interests include (i) structural studies of the regulation of cytoskeletal dynamics, and (ii) structural studies of macromolecular complexes involved in macromolecular transport, transcriptional regulation and cell cycle control. Macromolecules are exchanged between the cytoplasmic and nuclear compartments through nuclear pore complexes (NPCs) that perforate the nuclear envelope. Specific carrier molecules, many of which belong to the karyopherin-b superfamily, mediate transport of cargoes through NPCs. We have recently learned that these carriers regulate other cellular processes, including mitosis and gene expression. The carrier molecules fall into two broad classes: importins, which carry cargo into the nucleus, and exportins, which carry cargo to the cytoplasm. Frequently, transport is controlled by the nucleotide state of the Ras-family GTPase Ran, which modulates the affinity of carriers for their cargo via complex formation. In nuclear import, cargo molecules are dissociated from importins by RanGTP in the nucleus. Conversely, RanGTP is required for binding of cargo to exportins in the nucleus. Knowledge of the structures of importins and several of their complexes has given an appreciation of how import cargo molecules are recognized by importins, and how RanGTP functions to release cargo molecules in nuclear import. However, the basis for the opposing functions of RanGTP in nuclear export — specifically, why complex formation is required to bind rather than release cargo in the nucleus - remained a major unresolved problem in nuclear trafficking. We recently addressed this question by determining the crystal structure of a nuclear export complex (Matsuura & Stewart, 2004). The structure (Fig. 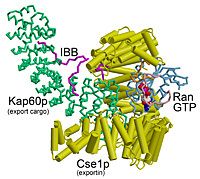 1) defined the precise interface between export carrier (Cse1p) and its cargo (Kap60p), and also demonstrated that RanGTP binding is intimately associated with cargo binding, thereby providing a structural framework for understanding nuclear protein export and the different functions of RanGTP in export and import. Structure-based mutants suggested that conformational changes in exportins couple cargo binding to RanGTP binding, generating a spring-loaded molecule that facilitates disassembly of the export complex following GTP hydrolysis in the cytoplasm. Actin is the most abundant protein in eukaryotic cells. Actin polymers form a double-stranded helical filament (the actin filament). The actin filament is essential for various cellular functions, including cytoskeleton, cell motility, muscle contraction, cell division and cell adhesion. Elongation and shortening of the actin filament occur continuously in the cell by assembly and disassembly of actin monomers at either end (Fig. 2A). The dynamics of this process is strictly regulated by a variety of actin-binding proteins. 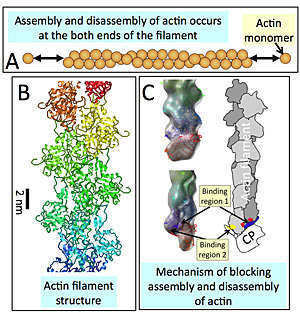 However, the detailed mechanism of actin dynamics and its regulation remain unclear, because the flexibility and small diameter of the filament has prevented us from structure determination. Recently, we have succeeded in aligning actin filaments in a strong magnetic field. The solution of the aligned filaments has enabled us to build a new model for actin filament structure, based on X-ray fiber diffraction intensities (Oda et al., 2009, Fig. 2B). We have also developed a method for determining the structure of the ends of the actin filaments, where the assembly and disassembly occurs, by cryo-electron microscopy (Narita and Maéda, 2007). The structure thus determined, of a capping protein (CP) bound to the barbed end of the actin filament, accounts for how CP stops the polymerization and depolymerization (Narita et al., 2006, Fig. 2C). These novel methods have also been applied to structural elucidation of the ParM filament (Popp et al., 2008), which is an actin homolog from bacteria, and a dynein-microtuble complex (Mizuno et al., 2007). Another difficulty in studying the actin filament comes from the lack of an expression system. To overcome this problem, we have developed a mammalian actin expression system in insect cells. The actin mutants expressed in this system clearly showed that polymerization is not coupled with the ATPase; rather, the former induces the latter (Iwasa et al., 2008). By combining our new methods with X-ray crystallography, NMR and biochemical experiments, we are revealing previously unknown features of the actin filament. The crystal structure of a nuclear export complex. Structural study of actin-filament dynamics. Takeda, S. et al. (2003) Nature 424: 35. Yamashita, A. et al. (2003) EMBO J. 22: 1529. Matsuura, Y. & Stewart, M. (2004) Nature 432: 872. Lee, S. J. et al. (2005) Nature 435: 693. Matsuura, Y. & Stewart, M. (2005) EMBO J. 24: 3681. Imai, H. et al. (2006) J.Mol.Biol. 359: 833. Narita, A. et al. (2007) J.Mol.Biol. 372: 1320. Koyama, M. & Matsuura, Y. (2010) EMBO J. 29: 2002.